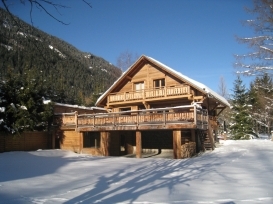 Outstanding 210 m² chalet on 3 levels for 10 people, located in the area of Les Bois, close to the golf course and 4 km from Chamonix center. Ground level : a twin bedroom and a double bedroom, both ensuite with shower room + toilets, TV and DVD player all zones. Steam room + shower. Laundry with washing machine and dryer. Ski locker with ski boots dryer. 1st floor : fully equipped kitchen with double oven, 5 gaz, fridge, freezer, microwave, dishwasher. Lounge/dining room with fireplace, giant flat screen TV, DVD player; satellite, internet, home cinema. Large terrace with garden furnitures. South exposure, view of the Mont Blanc. 2nd floor : 2 double bedrooms, both ensuite with bathroom (one with shower one with bath) + toilets, TV, DVD player and balcony. A bedroom with 2 bunk beds linked to one of the twin bedroom. Outside car park, covered car park, garden. No pets. No smoking inside. General: Outstanding 210 m² chalet on 3 levels for 10 people, located in the area of Les Bois, close to the golf course and 4 km from Chamonix center. Bedrooms: 1 twin bedroom and a double bedroom, both ensuite with shower room + toilets, TV and DVD player all zones. 2 double bedrooms, both ensuite with bathroom (one with shower one with bath) + toilets, TV, DVD player and balcony. A bedroom with 2 bunk beds linked to one of the twin bedroom. Kitchen: fully equipped kitchen with double oven, 5 gaz, fridge, freezer, microwave, dishwasher. Lounge:Lounge/dining room with fireplace, giant flat screen TV, DVD player; satellite, internet, home cinema.